A roadside shaded fuel break assures that fires originating from the road aren’t able to travel up into the tree canopy, where they easily spread out of control. Hazardous fuels reduction: Recent fires, the drought and those impacts on the watershed have highlighted the importance of improving fire safety and the health of our homes and lands. After developing the 2002 Lower Mattole Fire Plan, we realized that today’s forest conditions present significant threats to the Mattole’s health. Past logging practices and poor re-growth have led to stands of dense, young forests, both of which increase wildfire risks. CalFIRE considers most of the Mattole watershed to be at a very high risk of wildfire. 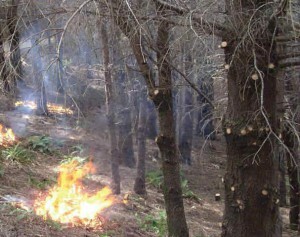 To address the situation, MRC works with landowners and public resources to create shaded fuel breaks along key public and private access roads, connect landowners with resources for conducting their own fire safe measures, and provides services for fuels reduction including a chipper with crew. Are you concerned about keeping yourself and your family safe from wildfire? Please visit our Fire and Fuels Resource page to learn more about local fuels reduction programs, or visit CALFire for more information.